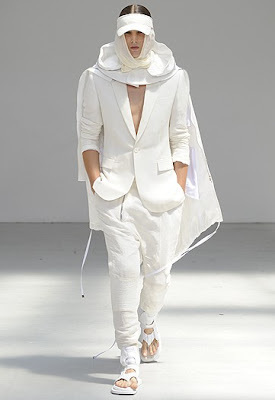 My first encounter with South Korean designer Juun J. was two years ago through his collaboration with Reebok. I remember seeing the black metallic high tops (click) and being rather taken by the design (I am still ever the fan of metallic footwear, particularly the brass and silver pieces Raf Simons created for Dr Martens, alongside his own Astro sneakers). After seeing the Juun J. collaboration I have to admit that his work, for the most part, fell off my personal radar, although the sheer polyviscose black trench coat from his last collection stands out vividly in my mind. 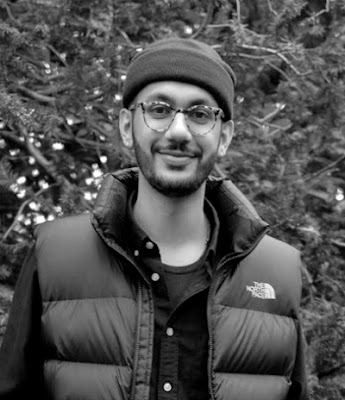 As such Juun J. 's Spring 2011 collection was something of a reintroduction for me, and I have no qualms in saying that it was a fantastic collection. 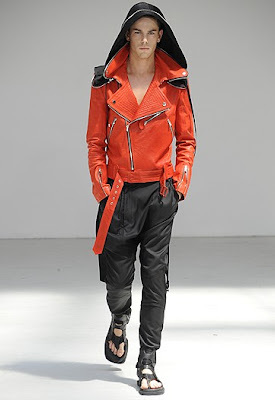 It featured oversized and lightweight shirt parkas, knitted drop crotch leggings, tailored canvas blazers, and even a red leather perfecto jacket thrown in for good measure. The military inspiration behind the designs were to be found not in the urban jungle or forest, where one invariably thinks of camouflage and khaki canvas, but rather in the desert. Yet that military inspiration served as an undertone, with a softer, more romantic edge throughout the collection. The prominent white and cream colour scheme was met with black, khaki and red along the way, providing nice bursts of more heavily constructed designs such as the perfecto jacket. 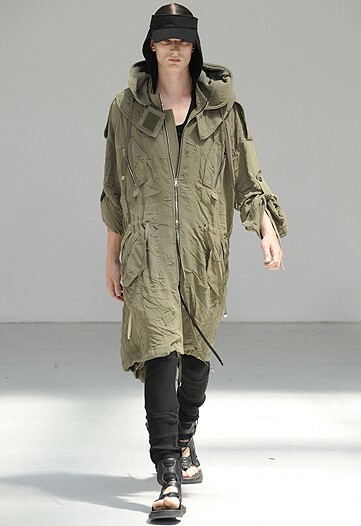 The oversized shirt parkas were interesting to see, in particular for the silhouettes they provided. The fact that they were somewhat sheer, thus exposing the bare torsos beneath, gave them a particularly vulnerable quality in wearing. Considering that feature, alongside the unbuttoned styling, loosely rolled sleeves, cinched waists, and silhouette offset by the knitted leggings, these looks had a soft, almost feminine quality about them. The silhouettes alone reminded me of a woman pulling on her boyfriend's shirt with legs left bare. 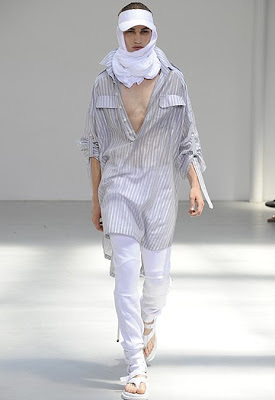 Indeed the length of the shirts was almost akin to a dress, especially when one notes the high slits either side. 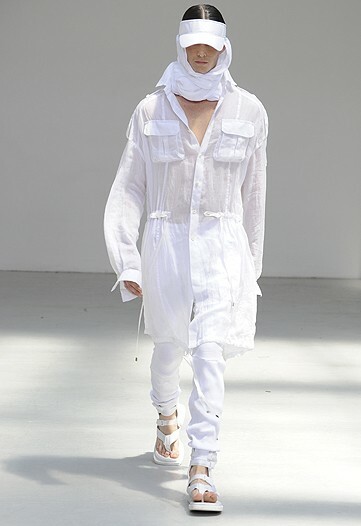 This is perhaps where the desert inspiration also comes into play, as it actually also reminded me of more traditionally Middle Eastern menswear garments. The pieces had the paraphernalia of functionality about them, with their shoulder epaulets and patch pockets, however the lightweight nature of the fabrics and their gentle draping over the body, gave them a particularly soft and gentle quality that belied such harsh practicalities. The knitted drop crotch leggings, with their ribbed knees and ankles provided an equally soft and delicate finish to the looks. Whilst the collection was dominated by deconstructed and oversized pieces, there were also tailored looks to be found. The blazer was intriguing, in that it actually featured a nylon parka that was rolled up into the collar. I thought the coupling of such a structured canvas blazer, with the drop crotch pleated trousers was an interesting choice. The trousers actually featured quilted knee pads, which like the rest of the collection, again provided an element of softness. 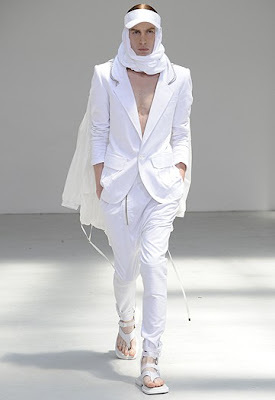 I have to admit that the stark white of the whole outfit was appealing. 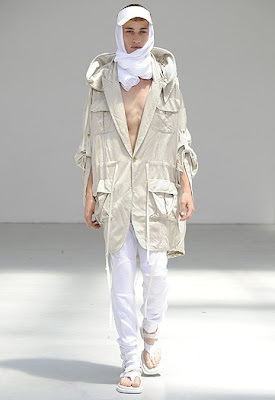 The mixture of fabrics and textures was also interesting, when one considers the canvas of the blazer, the stretch cotton of the trousers, and the nylon of the parka hanging behind. 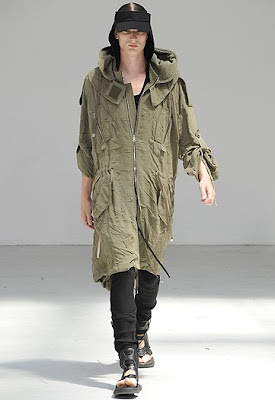 This khaki parka was one of my favourite pieces and actually featured a cape overlay on the back. 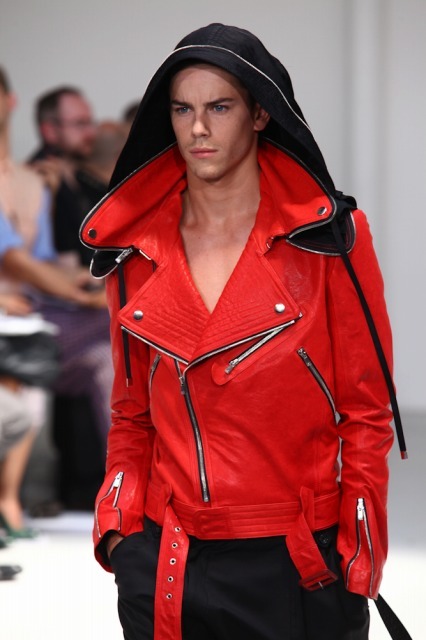 I really do like this red leather perfecto jacket. Note that the hood actually comes out of the collar, allowing it to be zipped away when not needed. Indeed such functionality was to be found throughout the Juun J. collection. Yet, what was so interesting was how original the concepts behind that functionality was. 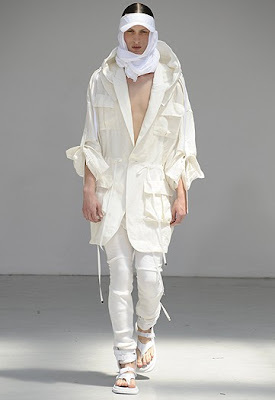 Having a nylon parka come out of the collar of a tailored blazer, or a hood from a perfecto jacket, or a knitted hoodie with a tuxedo tail, was quite the fascinating and unexpected mix. In that sense I think it was the attention to details that made the collection so strong, and indeed each piece clearly contained something unique for the wearer to appreciate. I adore the red perfecto ! Love the beach-y vibe of some of those oversize shirts and jackets! It's like a fantasy but realistic of what to wear in the desert, which means I like it a lot. I never see the imagery until I read your description. A knitted hoodie is genius. 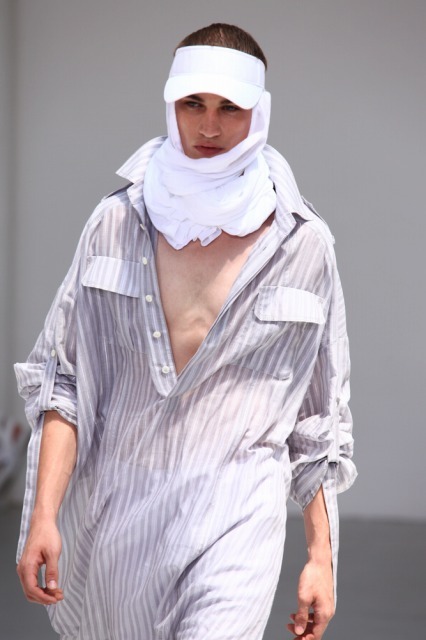 Arabic chic is getting really big. Loves this. What an interesting collection! The stark whites and light tones of the pieces really soothe the eye, so that when I saw the last photos, my eyes were literally shocked by that bright red. The red is a bit out of place I think, but I do like those oversized, draped shirts.